After installing Exchange Server 2016 into your organization you may receive reports from your end users of a security alert containing certificate warning messages appearing in Outlook. Why Does Outlook Display a Security Warning for a Certificate Problem? When you install Exchange Server 2016 into your Active Directory environment the setup process registers a Service Connection Point (SCP) for the Autodiscover service. Autodiscover is used by client applications to discover information about Exchange mailboxes and services. For example, Outlook uses Autodiscover during the setup of a new Outlook profile to discover the server settings for the user, so that the profile can be automatically configured (instead of the old days of manually entering server names and other details into Outlook). Note: Previous versions of Exchange used the Get-ClientAccessServer cmdlet. With the changes in Exchange 2016 server roles architecture the new cmdlets for these management tasks are *-ClientAccessService. The old cmdlets are still available in Exchange 2016, but if you use them you will see a warning message that they are deprecated. Autodiscover is accessible via an HTTPS (SSL) connection from clients. The Exchange server also has a number of other web services that are accessible using HTTPS connections from clients, such as Exchange Web Services (EWS), Outlook on the web (also known as OWA), ActiveSync (for mobile devices), and Outlook Anywhere (used by Outlook clients). It is not recommended to leave the Autodiscover URL configured with the server's fully-qualified domain name. Instead, you should configure it to use a different DNS name or alias. This is part of your overall Client Access namespace planning for Exchange 2016. In this example I will change the Autodiscover URL to use the DNS name of mail.exchange2016demo.com. However, as this is also a new server installation all of the other HTTPS services also need their URLs reconfigured. You can read more about that here, and also download my PowerShell script ConfigureExchangeURLs.ps1 to make the process easier. In some cases an IIS restart on the server is also necessary after configuring the namespaces. You also need to add a DNS record for the namespace if one does not already exist. In this example I add an A record of “mail” to my internal DNS zone, and point it to the IP address of the Exchange 2016 server (because it is the only server in the organization). If you have multiple Exchange servers then either DNS round robin or a load balancer could be used instead. The common causes of Outlook security alerts containing certificate warnings are misconfigured Exchange server namespaces, and invalid SSL certificates. Using the steps demonstrated above you can reconfigure your namespaces and/or install a valid SSL certificate. When your Exchange server's configuration has been corrected the Outlook security alerts should stop appearing for your end users. Exchange 2013 did this as well. Setting autodiscoverinternalserviceURI is the first thing I do. Great article. If we will have four exchange servers on that case which server we have to point like Exchange A , Exchange B , Exchange C and Exchange D . Which server name we will use for FQDN. You don’t use a server name, you use a DNS alias. I created with the FQDN to IP, added that IP in Exchange 2016 (only have one yet) in coexistence with Exchange 2010 and ran the command to change the InternalUri the Autodiscovery. What I realized on the client outlook? He communicated with the IP of the new FQDN, but looking at the status of the client connection outlook, it is still showing that you are connected to the FQDN of the server, which should be the new FQDN that changed in InternalUri. I logged with another user and created from scratch profile and he did the same thing, it shows that the FQDN is connected with the server name instead of showing logging in FQDN that created again. If all you’ve changed is the Autodiscover URI for the new server that is just part of the solution. Read the article again, it references the other namespace configurations that are also needed for a newly deployed server. assuming the mailbox your testing with is on 2016. Thanks for your amazing articles! I have followed all of your information about this certificate warning, but I have one pesky machine that is still throwing this warning. All of the other machines do not show the warning. They are all using Outlook 2007 (yes, I know it is not supported with Exchange 2016, but it is working). The one with the issue is the only Outlook 2013 install in the whole company. I did a ctrl click on outlook icon in the system tray and chose to test auto configuration and in the results, all of the entries have the correct FQDN. On the exchange server, I have set ALL of the virtual directories with the same FQDN for internal and external. I have an internal DNS entry for the server pointing to the internal address, and in our outside DNS, the entry points to the outside ip. Everything seems correct, yet this one machine still throws the error. Outlook can cache Autodiscover info for a while and cause the issue to remain. If you recreate the profile does it go away? No it did not. I recreated the profile twice and it is still coming up! Check for hosts file entries on that one computer, perhaps it is trying to connect to something else. I’ll check, but I did ping the mail server by its FQDN and came up with the correct ip! Your clients shouldn’t be attempting to connect to the server’s FQDN though. Paul, I can always count on you when I’ve been banging my head on a wall. I am about to help a small business client switch to an external trusted cert and I was testing on my own two node dag. I created new (self-signed) cert with only the webmail.domainname.com and autodiscover.domainname.com. I modified ALL the Virtual Directories (multiple times because it still gave cert error). I would open Outlook and after 20-30 seconds I’d get the security cert error pop-up with the name of one of my exchange servers. Arrrrgh. Then I saw your comment about Outlook profiles hanging on to outdated information. I created a new profile about 30 minutes ago. Mailbox has finished sync’ing up and I still haven’t gotten the offending pop-up. Great call. I looked in the registry in my old profile and did not see the server name anywhere. Anyway to clean that up without creating a new profile. I can see this will be an issue with the small business that I’m about to switch certs. Oh well….they pay me by the hour. Not the Server’s FQDN, sorry if I was misunderstood. The server’s FQDN is xyzserver.xyz.local. The external URI is mail.xzy.com. The internal URI is also mail.xyz.com. The internal DNS server points mail.xyz.com to 192.168.1.3, while external DNS points it to some outside public ip. If they ping from their worksation mail.xyz.com they get 192.168.1.3. That is what I meant. On the exchange server, I set all of the Virtual servers to use mail.xyz.com as the internal and external URI. So when configuring Outlook 2007 (again, I know it is not supported), I put mail.xyz.com as the server name and mail.xyz.com in the outlook anywhere proxy section. On Outlook 2013, it does it all automatically, so I put in her email address (Janedoe@xyz.com) and her password and it auto configures nicely. I even tried doing it manually and typing in the servername, mail.xyz.com, but it ends up the same as if I had let it autoconfigure. End result is that on Outlook 2013, she still gets the certificate warning. What exactly does the certificate warning say? Which of the validation items is failing? The certificate is for mail.xyc.com. And then please email me the results of both to paul at this domain. I’m just having trouble visualizing your scenario. Do I need to edit the scripts before I run them? Did you ever a resolution on this? I am working with a customer that has a .local internal domain but the cert cant have the .local name. What did you do to get outlook clients to work without getting cert warnings? My only other option i am seeing is to create another OWA site with a new IP to assign the .local internal CA cert to. Don’t use the .local domain for the Exchange namespaces. Use a valid domain that you can get a certificate for. Use split DNS to control where it resolves to for internal vs external clients. Is it possible to prevent exchange from “announcing” those virtual directories immediately? Even if the SCP is changed to the “correct” DNS name as fast as possible, it seems that the virtual directories are distributed to outlook clients and somehow cached on the existing exchange servers. We have a lot of outlook online clients, and I could not prevent the certificate warning for almost an hour. Had to reset IIS on the existing exchange 2013 servers, which made a lot of noise also. No. Well, sort of. This article explains one way to mitigate this situation. But if you suspect a problem you can recycle the Autodiscover app pool in IIS without doing a full IIS reset. that would be an option. with sites. but, will prepare a script to recycle app pools across the ex servers I think. Worse than I thougt. A lot of the outlook online clients got the 2016 exchange server name in their profile. and even that the correct names are now replicated, the outlook clients just promps for password and the profile points to the 2016 wrong name. only solution is 2 delete the profile. THEN autodiscover works and set the right server name. 1. Register the servers Client point with your configured value. 2. Tell the other servers, that this server is now ready to announce virtual directories. For Outlookanywhere I assigned mail.domain.ru for both servers as well. As I know in previous version of Exchange we have to change Cas server to FQDN CassArray Name or Alias in mailbox setings . I mean we should run command Set-MailboxDatabase -RpcClientAccessServer , but the commant as I know occur with error. Paul, sorry for my long story. Do you have any ideas what I have to do? May be I should create Cname records for FQDN the both servers and include them in certificate? 2. Hopefully your DAG’s FQDN is not mail.domain.ru. 3. Setting the RPCClientAccessServer on databases is not required in Exchange 2013 or 2016. Hi, Paul. Sorry for long break. My DAG’s FQDN is not mail.domain.ru and I’ve used your script to change my Exchange’s virtual directory from FQDN to mail.domain.ru for both Servers. But when I try to connect to Exchnge occurs fail and appears a notice ” The connection to Microsoft Exchange is unavailable”. Certificate is a valid and not self-signed . I took desicion to use DNS Roun Robin. So, outlook try to connect not namespace mail.cpxdemo.ru and to one of FQDN. OWA, ECP and etc. are working perfect. Do I need to configurate anything more? By the way , I changed only internal URLs, external URLs have not used and no internet access. What does the certificate warning say? It will tell you the name that the Outlook client is trying to connect to, as well as the reason the certificate warning has appeared. I don’t understand your answer. If you think the certificate warning shows that the client is trying to connect to the wrong server name, you should check all your Exchange namespaces to make sure you’ve configured the internal and external URLs correctly. Another important consideration when you run into this issue after installing a 2016 server in your environment is MAPI over HTTP. When you install the first 2016 server MAPI over HTTP is enabled and if the new 2016 server which is a CAS by default resides in the same site as your old CAS server it will proxy and server clients. When we encountered this issue after installing our first 2016 server we corrected the issue by fixing the MAPI VD internal and external URLS to use our DNS alias which resolved the issue for us. Configuring the namespaces for all services (including MAPI) should be one of the first steps anyway. I am in the process of migrating from 2010 to 2016. I moved over a few mailboxes, and then I started receiving an error. “There is a problem with the proxy server’s security certificate. The name on the security certificate is invalid or does not match the target site FQDN of my server. The strange thing is that half of the users I have migrated work without any issues. In addition, any NEW users connect with no issues either. I can just click ok to the error, and everything still works, but its annoying and I would like to resolve this prior to completing the migration. Any ideas? 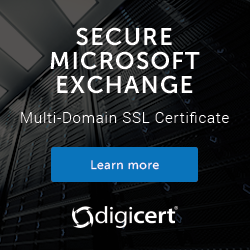 Does the self-signed certificate have one of the Exchange servers names on it, or the load balancers name? What happens if you bypass the load balancer? first of all thanks so much for great articles. I’ve recently installed an Exchange 2016, with multi tenancy. Assume I have 2 domain: DoaminA.com and DomainB.com. Now how am I supposed to configure autodiscover URI? I have 2 accepted domain, so I created 2 SRV record instead of “autodiscover.DomainA.com” and “autodiscover.DomainB.com”.But I don’t have any valid SSL yet. the problem is people can’t connect to exchange through outlook 🙁 it’s ok with IOS Mail application though! TechNet has documentation for this. I have a disk consumption issue. After installing Exchange Server 2016 and configuring all everything correctly, my HDD is being consumed at a very fast rate, like a partition of 320GB shrunk to 60GB the following morning but after doing some checks found in C:windowstemp some .tmp files being created at a very fast rate. Please help because cant get to know whats causing all these files to be created at that very fast rate. outlook will not let me get in to my e-mail account-says over and over some security error just keeps popping up for last 36 hours – how do I read my e-mails — they are piling up ? why ami blocked? Call your IT Help Desk, they can help you. First of all, thanks for a great article! As always you make things brilliantly easy to understand. I have question which I hope you will find time to reply to. I’m planning to install Exchange 2016 into an existing Exchange 2010 organization which consists of one server only. However, I don’t plan to configure anything else (routing, connectors, etc.) on Exchange 2016 for some months. Question is – will just installing Exchange 2016 to leave it alone without configuration – affect the existing autodiscover/Outlook Anywhere functionality? I would question why you’re installing it months before you need it. It’ll always be a thing sitting there that you need to maintain and think about any time there’s a troubleshooting scenario. As long as you get the Autodiscover config set, yes. Having trouble getting my certificate warning to go away and outlook anywhere working properly. My local domain is internal we will say exchange.contoso.internal. I have a FQDN mail.contoso.com that is signed to that domain and also autodiscover.contoso.com. Local clients still get a certificate warning pointing to exchange.contoso.internal after running your powershell script on exchange 2016. In DNS I have authority setup for contoso.com and have an a record for mail.contoso.com pointing to my internal IP of exchange (also one for autodiscover.contoso.com). OWA works from outside and in, mail is flowing. Local outlook clients work fine except for the cert warning. After running the script some outlook clients have troubles connecting, they continually ask for a password even after providing the correct credentials. Did you install a certificate? Which versions of Exchange are running in the organization? I’m having issues with Outlook 2016 after upgrading from 2013. I had to add AutoDiscover (autodicover.domain.com) to our External DNS in order for 2016 to get the mail profile. The mail server used to be remote.domain.com. The DNS entry is still there but outlook is looking for remote.domain.com and the cert displays autodiscover.domain.com. I understand that they don’t match and I’m getting the “The name on the security certificate is invalid or does not match the name of the site” warning when launching outlook. Do you know of a way I can remedy this? Installing the self-signed certificate is not working correctly. If these are internal Outlook clients, you should be configuring the AutodiscoverServiceInternalUri as demonstrated in the article. Whatever name you choose (autodiscover.domain.com is fine) then needs an entry in DNS pointing to your Exchange server (or load balancer if you’ve got multiple servers), and the SSL certificate must include that name. Also just to add, if you’ve got Autodiscover configured correctly don’t forget that all the other namespaces on the server also need to be configured. Any suggestion will be much appreciated. Thanks. I had to apply both methods to resolve the issue. Just changing the registry did not do the trick. In Method 2, I didn’t have to use the new profile after creating it. Just adding it was enough. The article’s title suggests the solution is for Office365 and it does not mention the Security Alert message. Though, in my case, we have Exchange 2016 and machines were getting invalid name security alert. So the solution works for in-house Exchange as well. A little more on the Cert warning that people often get. We are receiving in Mac Outlook a cert warning for the DNS Domain Name. “exchange.DNSdomain.com” but this is listed only as an internal name. Exchange users “exchange.mailDomains.com” for auto discover in DNS and as configured on the exchange server. Why would outlook keep hunting for a secure connection to the “exchange.DNSdomain.com” when it is not external used? How is it even picking this up when the DNS Auto discover setings are correctly set and tested with the connectivity test website? Outlook checks for Autodiscover in a number of different ways. One of them is by looking for the well known CNAME of “autodiscover”. If that resolves in DNS, it will try to connect. You can suppress that lookup using Group Policy. Or you can remove the DNS record (but that might break other clients relying on it). The other possibility is that your CAS Autodiscover Internal URI is set to that URL. That will not be tested by the connectivity analyzer, because it’s only testing externally and can’t see the Autodiscover SCP that is used inside your domain. So you should check that as well. I have exchange 2007 and installed new exchange 2013. i am having Trouble in certificates assignment. when i am going to ECP on server 2013 it is showing me only local domain and no other domain. Any idea what should i do. previously we were using self assigned certificates and now i plan to use third party certificates. what thing i need to consider. just forgot to mention that i have not done any settings in Virtual directory (except one ) do i have to do those one first ? because i configured OWA internal url and external Url and after that OWA is appearing in Certificate menu with right domain name. Yes you need to set up your namespaces first. Thanks a lot Paul, do i have to configure them on Exchange 2007 ? or 13. Both. What guidance are you following for this migration? The steps are documented on the Exchange Deployment Assistant that is available on TechNet. i read some of your guidance documents , not sure but do i have to remove first two A records for Exchange 2007 and leave all others on Domain Controller. will it create any problem for the client which are already connected and do i have to assign new certificates on exchange 2007. Hi Paul, I tried to put some comments but i believe bcz of ip address and other configuration they get removed. I am following guidance given under techgenix and a guy tried to explain everything but i am stuck at this point. Hopefully this time my comments will go through. as i removed all ip address . I think you should engage a consultant for this work. Your Exchange 2007 environment is not set up correctly in the first place, so that needs to be fixed first before you can plan the upgrade. A consultant can review your environment and recommend a course of action to resolve the current issues and perform the upgrade. There’s only so much advice I can give you based on bits of info in your comments. My reply gets deleted. Can you please tell me why. Thanks for all the good content and info across your whole site. I am getting the certificate issue for a user on the 2016 server. the cert is SSL form GoDaddy and has the mail domain name. I had to export this from the old 2010 server and import to the new. Per Microsoft instructions, the cert on the Exchange server when viewed has the certificate authorises in the chain as expected. However when you go view the cert from outlook error it does not contain the chain just the email domain. so it states it does not trust the provider. It was installed correctly and added to all the services including mapi so a bit stuck. Do the clients have any issues with that cert when they connect to the Exchange 2010 server? So yes clients connecting to the 2010 exchange get a cert error. Now i put this down to the fact that the virt directories were never configured to the name on the cert. They were left as the server name. My thinking was to leave that as is, I set the correct name on the virt directories on the new exchange and then could right away point the dns record at the new exchange. Here is were I am. Outlook 2010 clients connect to the new exchange with a proxy error code 10 but still work. Outlook 2013 clients cant find the server. So it must be security related, but in essence autodiscover is failing? I have changed the virt directories back to the server name as if I use a machine with a host file pointing mail domain to the new exchange not even the 2010 clients can connect to it. So as a general rule I fix any namespace issues with the existing environment before I proceed with install or migration to a new version. It makes the co-existence period seamless if you fix the existing problems first. I fixed everything got everything smooth except the outlook connection. After a few hours of frustration I found it was the proxy settings intercepting the connection. Even though bypass local addresses was set and the mail domain was in the advanced exceptions list. I presented a new Ex2016 server and already changed the AutodiscoverServiceURI to https://company.com/Autodiscover/Autodiscover.xml and Outlook keep protesting for the certificate. Strangely enough, the security alert “View Certificate” button shows the right * certificate but the error message shows the server FQDN. X The name on the security cert is invalid or does not match…..
Did you also configure the rest of the client access namespaces? No, that was certainly the issue. I was missing EWS, ActiveSync and the other websites. Great articles. But I did not find a solution to my issue. After installing two servers, Server 2016/AD/DNS and Server 2016/Echange 2016 CU7, and configured and tested that I could send and receive email. I then made what I think now is the blunder. I renamed the Exchange server to follow a name standard, from SD-EX-01 to SD-EX-001. After this I can’t log in with https://localhost/ecp or …/owa anymore (also not the host or fqdn). When I look at the certificate when I get the warning, I see it has SD-EX-01 and not the new name in it. I seem stuck. Any suggestions how to proceed or do I reinstall? It’s not supported to rename a server after installing Exchange, and that most certainly will break it. At this stage I recommend you treat it as a failed server and do a recovery install. This helped me fix my SMTP TLS Certificate Error thanks. However still having and issue I have a split dns name domain.work / domain.internal for our email addresses. The Server’s actual name is exchange1.domain.work and that’s not matching the wild card certificate used which causes an error. The Security Alerts pops up with exchange1.domain.work at the top and when I view the cert its using my wildcard domain.com one which is correct how do I fix this? I had an exchange server failure this past weekend. I have rebuilt the server. I was able to get the DAG reconfigured and the DB’s in the DAG. All is good there. Now I am getting a certificate error so I noticed the certificate is assigned to the server that existed already but it is missing from the newly formatted and installed server. I have tried to export and import the certificate from the original server but I keep getting this error. A special Rpc error occurs on server XCH02: Cannot import certificate. A certificate with the thumbprint FCBF254E775FC90925ED5AD997DC90503C02234A already exists. I am not sure where to go with this and was wondering if you could pleas offer me some assistance. Here I am always jumping the gun. I got it figured out. I had to remove the certificate from the certificate mmc console and then it let me add it. I am not sure how that got there but it is all fixed now. We will be installing 3 new 2016 Exchange servers that will only be used for the migration of mailboxes to Office 365 so we can achieve greater throughput. They will never be used in the production Exchange environment going forward. Is there a recommended best practice during install or config to avoid these servers ever being used for Autodiscover services and the certificate prompts? If all Exchange traffic hits a load balancer first which directs traffic to the production servers can we just change the internalURI and be done with it? Depends what your existing environment looks like. But also keep in mind that if these servers are going to be migration endpoints for your EXO migration, they’ll need a valid third party cert installed anyway. Personally I would set them up to work as seamlessly as possible in co-existence so that there’s less risk of unexpected issues. Thanks Paul, yes we will be installing a valid third party cert for migrations so makes sense to just go all the way through and get them setup seamlessly. Paul, thx for your article. Can you help me in configuring namespaces for our Exchange? We have domainname kalina.ru, Windows Server AD with name b26.kalina.ru. Exchange Server with name forth.b26.kalina.ru. mail.kalina.ru is CNAME forth.b26.kalina.ru and when users in office launch Outlook they got warning about certificate (name mismatch forth.b26.kalina.ru), which issued by Geotrust to *kalina.ru and kalina.ru. When users connect via browser to https://mail.kalina.ru/owa – certificate shows as valid, with green lock. Can you explain how to properly configure the DNS records so that we do not receive a certificate warning? Great article. I would like to know whether after installing Exchange 2016 in the existing Exchange 2013 setup, Can I use a two different DNS name space for autodiscover and outlook anywhere. For e.g Exchange 2013 using DNS alias host.xyz.com and Exchange 2016 using host2.xyz.com. In short can I have few users connecting to Exchange 2013 and other users connecting to Exchange 2016 in Coexistence setup. Thank you very much for all articles. You are the best! For legacy reasons, we are stuck with a .local internal DNS name. You said in a comment above to “Use split DNS to control where it resolves to for internal vs external clients”. We have Exchange 2019 up-and-running; how do I stop the certificate error coming up every time Outlook 2019 starts? Our external domain name has a valid GoDaddy certificate which I’ve imported into Exchange and the OWA works fine from an internet connected PC as do iPhones connecting to Exchange, but the domain PCs throw up an error every time because “The name on the security certificate is invalid or does not match the name of the site”. this resolves to the internet address of our SonicWALL firewall that routes the traffic through to the IP address of the Exchange server.